Hi foodies. Welcome to AYESHA'S KITCHEN. Here i came with a perfect chicken Pulav / pulao / pilaf recipe. 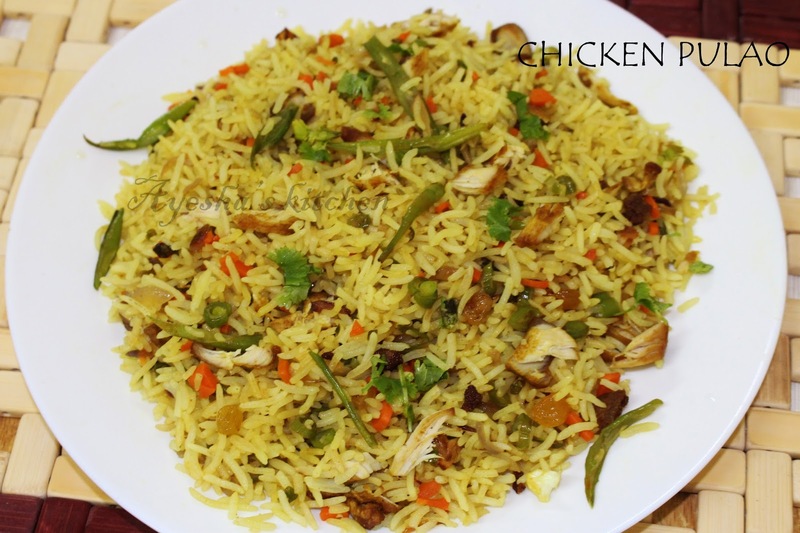 Chicken Pulao is a very easy one pot meal that satisfies our taste buds. It is very healthy when compared to biryani and fried rice, that for most of the pulao we use vegetables and no need of adding sauces too. 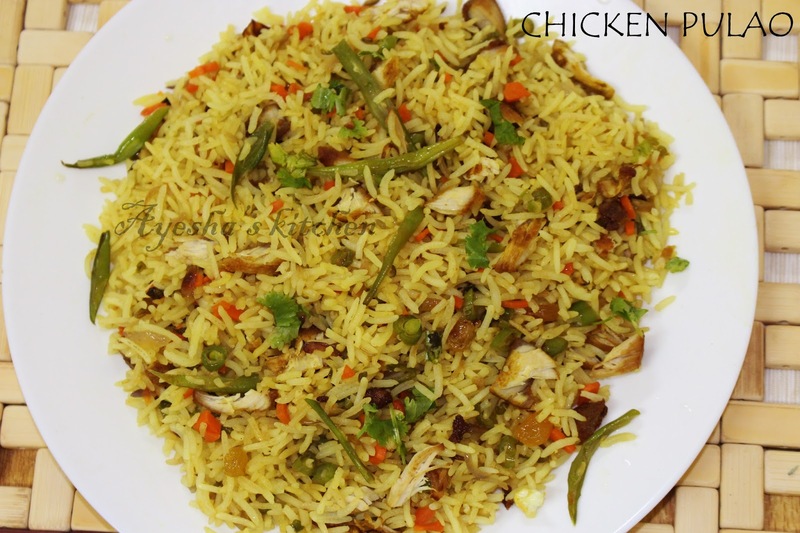 Here is the recipe of very tasty chicken pulao where the chicken is cooked, shallow fried and then shredded . 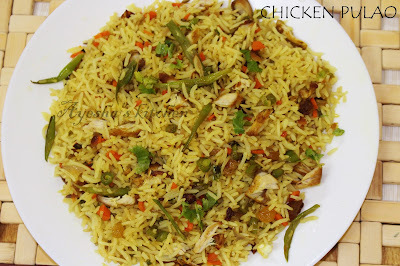 And the use of more vegetables and chicken stock water makes this pulao something more special. Do try and enjoy cooking. First we have to cook the chicken. Marinate the chicken with a pinch turmeric powder, ginger garlic paste and salt. Then boil the chicken in 3.5 CUPS of water . When chicken is done, transfer the chicken to a bowl and keep the stock water aside. Heat a non stick vessel with 1 tbsp of oil and just shallow fry the chicken pieces for 3 minutes in a medium flame and set aside. Once cooled, shred the chicken pieces and transfer to a plate. In the same vessel, heat some ghee / oil. When hot, add cardamom, cloves, star anise, cinnamon, fennel seeds and saute for a while till fragrant. Then add sliced onion, saute for 2 minutes. Then add ginger garlic paste, saute for a while. Now add chopped carrot, french beans and cook for few minutes in a medium flame until the vegetables are half cooked. Add some salt too. Now add the hot chicken stock along with water if needed ( we took 2 cups of basmati rice. SO WE NEED 3.5 - 4 CUPS OF WATER. IF THE STOCK WATER IS LESS, U CAN ADD BALANCE AMOUNT OF HOT WATER). After 10 minutes mix gently the shredded chicken pieces to it and can add some ghee now (optional) which gives a fine aroma.